Despite their tiny bodies, mice eat between 15 and 20 times a day. A house mouse produces between 40 and 100 droppings per day. Mice can actually carry as many as 200 human pathogens!Even the smallest amount of mouse urine can trigger allergies, particularly in children because their immune systems are still developing. Mice spread disease through bite wounds and by contaminating food and water with their waste products. Mice can also spread disease thanks to parasites, such as ticks, fleas and mites. These parasites bite the infected mouse and then spread the disease by biting humans. 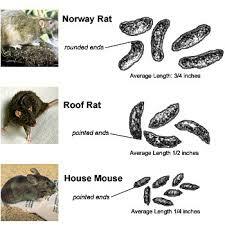 • An adult rat can squeeze into your home through a hole as small as the size of a quarter. • Rats can live for up to 18 months, but most die before they are one year old. • Rats have strong teeth that allow them to chew through glass, cinderblock, wire, aluminum and lead. • Smell, taste, touch and sound help direct them to their food sources. • Rats are also responsible for spreading bubonic plague, also known as the "Black Death". Although fleas are primarily responsible for infecting humans, they were originally infected with the plague by feeding on the blood of rats. Rats are scavengers. They have an excellent sense of taste and a good memory. A rat can identify certain substances, including rat poisons, after just a tiny taste of it.